The base model of the 2011 Ford Mustang will come with nearly GT power and could get up to 30 miles per gallon in highway driving, Ford Motor Co. announced today. Ford will debut a new V-6 engine for the sports car this week at the Los Angeles Auto Show and says it will give the basic Mustang power to rival the performance-oriented Mustang GT, which has a V-8 under its hood. The 3.7-liter powerplant, which replaces the 4-liter V-6 now in Mustangs, will produce 305 horsepower and 280 pound-feet of torque while also offering better gas mileage. Ford projects the engine will get 19 mpg in the city and 30 mpg on the highway. The 2010 Mustang's 4-liter engine creates 210 horsepower and 240 pound-feet of torque, while achieving 18 mpg in the city and 26 mpg on the highway. The new Mustangs will be available at dealerships in the spring. Stephanie Brinley, an automotive analyst at Southfield-based consulting firm AutoPacific Inc., said the additional power catches the Mustang up to the V-6 Chevrolet Camaro and should help it stay at the top in pony car sales next year. "The V-6 Mustang is Ford's best-selling Mustang and this is a lighter car, so it should feel faster," she said. "For people looking for these kinds of cars, Mustang is still the place to go." According to Autodata Corp., which compiles car sales statistics, Ford sold 56,469 Mustangs through October, down 32.4 percent from the same period last year. The Mustang remains about 8,000 units ahead of the Camaro, which was reintroduced this year by General Motors Co. The new powertrain suggests that the GT will have to show some big improvements soon, Brinley added. 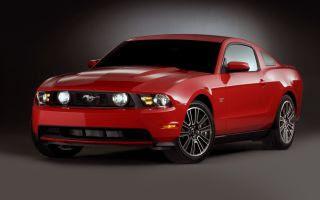 The 2010 GT with a 4.6-liter V-8 produces 315 horsepower and 325 pound-feet of torque. It gets 16 mpg in the city and 24 mpg on the highway. By raising the base model's vitals and performance level, Ford likely will have to do the same to the 2011 GT, though the carmaker has not announced a new powertrain for that car. The V-6 Mustang will come with a six-speed automatic or manual transmission, dropping its well-used five-speed. Ford has promised to include six-speed transmissions on 90 percent of its vehicles by 2013 in another effort to make its vehicles more fuel efficient. The new Mustang V-6 engine, built in Cleveland, boasts a number of high-tech features such as variable camshaft timing and variable valve overlap to improve the car's emissions, fuel economy and power. Ford has dubbed the system Ti-VCT. "Drivers are going to notice improved low-speed torque and increased fuel economy and peak horsepower," Jim Mazuchowski, Ford's manager of V-6 powertrain operations, said in a news release. "Plus, there are benefits they won't notice, too, such as reduced emissions overall, especially at part-throttle." Ti-VCT can lower the engine's emissions by controlling the NOx -- nitrogen oxide -- and hydrocarbons. Ford will also announce at the Los Angeles show that it will introduce a performance package for the V-6 Mustang. It will include a different rear axle for faster off-the-line acceleration, struts, stabilizer bars and brakes from the GT, unique badges and other features.